Ed Pauls was the inventor of the Original NordicTrack skier he got the idea to create the NordicTrack in the winter of 1975. He was training for a cross country ski race, during that particular Minnesota winter it was exceptionally cold and windy he found it extremely difficult to train for this cross country race due to the darkness, cold and temporary lack of suitable snow. While he was out on a jog preparing for this race he found himself on a dark, ice covered street he thought there is no reason why I couldn’t build an exerciser to duplicate the motion of cross country skiing. If he could create the machine he could train indoors and never miss a training session again due to bad weather. Ed Pauls was a mechanical engineer so he had the background and qualifications necessary to accomplish the project. After a year and half of prototype design and development work, the first production NordicTrack’s were shipped to enthusiastic customers, primarily cross country ski racers. Ed Pauls built NordicTrack from the ground up in Chaska, Minnesota he worked very hard and was extremely dedicated so of course NordicTrack grew at an astronomical rate. 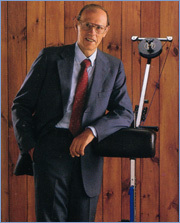 By 1988 NordicTrack grew so popular that he found it difficult to keep up with the demand so he decided to sell NordicTrack to a large corporation called CML. Ed Pauls remained the CEO of NordicTrack for a couple more years until he retired. CML was located in Boston, Massachusetts they kept the NordicTrack Facilities in Chaska, Minnesota eventually expanding the manufacturing to Glencoe and Belle Plaine Minnesota. When NordicTrack was acquired by CML the ski machines became a must have for every household in America and abroad. During the 1990’s CML expanded NordicTrack to include non motorized and motorized treadmills, elliptical machines, and weight training machines, sit up machines, just about anything to do with the fitness industry NordicTrack was the leader. NordicTrack grew to such a large corporation that it was difficult to sustain the growth. Around 1997 NordicTrack started to realize they had to downsize. The exercise equipment market was now saturated by NordicTrack and with the competition from other exerciser companies it was now difficult to remain the leader in the fitness industry. NordicTrack continued to stay in business for the remainder of 1997 even though times were difficult. In Oct of 1998 the funds had been depleted NordicTrack had no choice but to file for bankruptcy. After the bankruptcy the NordicTrack name was sold to another company.